The Peace Lily is actually more of a plant than a flower, and will only bloom once or twice in its lifetime (with a lot of TLC). However, to keep the vibrant green leaves in tact is a whole lot easier. And, best of all, it’s listed by NASA as one of the most effective air purifiers (tying with the Florist’s Chrysanthemum). This plant filters out common household toxins such as formaldehyde (found in some tissues, paper towels, napkins and just generally in the air), benzene (found in synthetic fibres and some detergents) and ammonia (found in some cleaning products, smelling salts and fertilisers). They only need to be fertilised once every few months, placed in softly sunlit rooms and you don’t need to water regularly (check once a week, and if the soil is dry give it some water, otherwise leave it). This plant is given its moniker due to its Swiss cheese-like appearance. Super easy to grow, the Monstera prefers warmer climates (perfect for Australian homes) yet doesn’t love direct sunlight. This means that it can still thrive in our colder months. To keep this plant alive and well through autumn, be mindful of not over watering, as this could lead to wilting leaves indicating root rot. This should be easy to avoid over the cooler months though, as they require about a third less watering in autumn and winter as they do in spring and summer. And, with that beautiful emerald shade, what a statement colour to liven up your new space! Easy and fast-growing, this is a low-maintenance lover’s dream plant option. It’s large leaves also make it a statement plant, so you wouldn’t need many (if any) supporting plants to lift the life of your room. 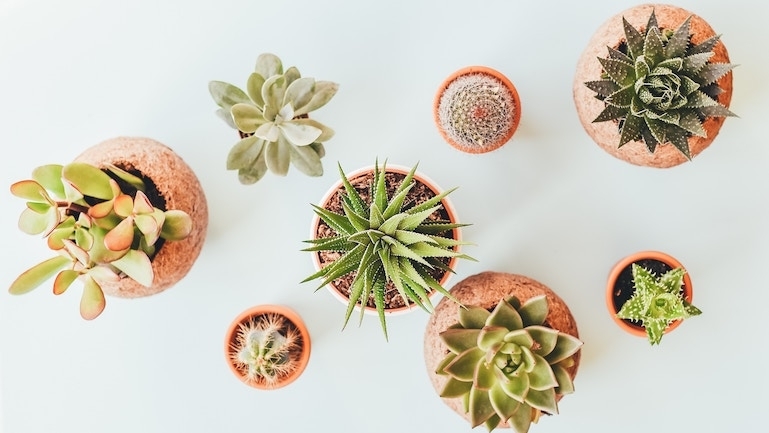 These plants enjoy humid places (so would actually work quite nicely in wet areas like your main bathroom or ensuite), but are still survivable in dryer areas if space doesn’t permit. Their upkeep requires little to no effort, enjoying sunlight and shade, moderate watering and are known for their penchant to steer clear of browning leaf tips that can turn otherwise vibrant plants into bleak additions. These plants may not be as vibrant in shade as others listed here, but they certainly bring a subtle beauty to any room. Their downward stems make them ideal hanging plants and can reach to almost a metre. Although the silver-speckled leaves are its most defining feature, they also bloom dusky, almost brown, pink flowers shaped like little lanterns. Place up high on a shelf, or in a hanging pot, and water as required (try not to let the soil dry too much, but over-watering is not necessary), and position in spot that allows for indirect sunlight. Looking for more home inspo? Head to our display centres to get a true feel of some of our most popular homes! Find your closest display centre here.